Chanukah is almost over, but we’ve still got a couple of really good specials for you here at ArtScroll! Today’s special is valid through midnight on Tuesday, so hurry and shop before these amazing savings are over. 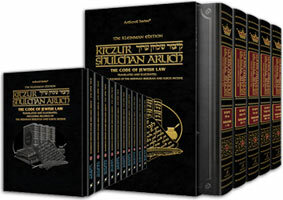 •Important rulings of the Mishnah Berurah and Igros Moshe, when they differ from the Kitzur. List Price: $129.99 | Now Only $77.99! List Price: $89.99 | Now Only $53.99! Hurry! These sales end at midnight on December 23rd. Don’t miss this great opportunity! * Daily Chanukah Special valid only on item listed above. Discount off list price. Valid through December 21st. Chanukah Sale discount valid through December 29th. All discounts off list price.